This lesson will provide a quick walk-through of the necessary steps to set up Attendance in Illuminate. Based off of your specific needs, these steps might need to be adjusted; please work with your Customer Success Manager to ensure appropriate setup. Attendance setup is guided by the specific state reporting requirements, the district’s attendance process, and the district’s own operating procedures. Due to the wide variation possible in each area listed above, the setup of the following can vary greatly between districts. However, each district will have to complete each of these steps in order for the attendance calculation to operate correctly. Steps: Admin Gear >Term Manager Click here for Help! Setting up the session/term correctly is an extremely important piece of ensuring correct attendance calculations. Entering in erroneous start and end dates for a term can cause a considerable headache when reporting rolls around. Option 1: Copy with adjustment- Allows for terms to be mass created based off of last year's terms and allows for a quick adjustment of the calendar start and end dates. Option 2: Copy and manually build- Allows terms to be created manually. Steps: Admin Gear > Calendar Click here for Help! As with Session/Term creation, the Calendar is another key piece of the attendance calculation setup. 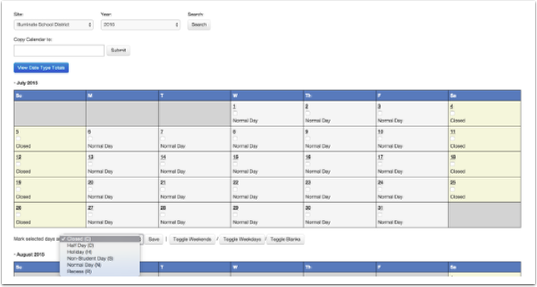 The Calendar utilizes specific day types to denote days in which a school is in session and out of session as well as also denoting days in which the instructional minutes are different (such as minimum day, late start, testing, etc.). An appropriately set Calendar enables a teacher to take attendance each school day while also allowing the attendance calculation to capture the total instructional minutes for each day. Districts operating rotating and/or block schedules can use the calendar to establish days in which an A day or B day will occur, thus enabling the appropriate class to have attendance taken on the appropriate day. Steps: Admin Gear >Timeblock Management Click here for Help! Timeblocks (or periods) and Timeblock Occurrences (classroom minutes) are used to help denote when attendance can and will be taken and, therefore, are extremely important to the overall accuracy of the attendance calculation. Since the variation of period structure is expansive (block, rotating, summer school, after school programs) each site must set its own Timeblock structure. After the specific Timeblock structure has been established, sites and/or districts will next need to set their Timeblock Occurrences. A Timeblock Occurrence is the timeframe in which a class will actually be in session and is used to calculate the total number of instructional minutes for the attendance calculation. For example, Period 1 ranges from 7:52am-8:43am. In this case, the Timeblock Occurrence would be 7:52am-8:43am. Occurrences should ONLY be added to timeblocks in which attendance is going to be taken. If you have timeblocks in which sections tied to those timeblocks will have attendance disabled, adding occurrences to those timeblocks could skew your Attendance Reporting (ADA) data. Steps: AdminGear >Reporting Periods Click here for Help! In order to ensure accurate tracking and reporting of attendance, you will need to set up Reporting Periods. Commonly referred to as Attendance Months, Reporting Periods are typically a time period of approximately 20 school days (no more than 22) in which the school is year is broken up into. Reporting Periods help maintain accurate reporting at the site and district. Locking attendance reporting periods will lock out all attendance editing for records that fall within the reporting period. It would need to be done at each site level for full effect. Locking an attendance period prevents all users from making changes to students' attendance flags/marks for the locked period. It will NOT lock changes to schedules or enrollment, which could also impact ADA reports. If needing to reconcile absences from a locked attendance period, you'll need to unlock it to make those changes. Steps: Admin Gear > Code Management > Funding Category Groups Click here for Help! 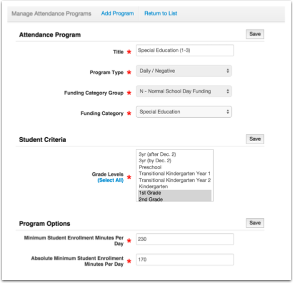 To enable usage of the attendance module and reports for more than instructional attendance reporting, Illuminate provides the option for districts to create Funding Categories Groups for programs outside the normal school day. By default, all districts will have a Normal School Day Funding; under this group, all traditional Funding Categories will be created for the sake of being included on attendance reporting. However, should a district have an after school program, they would be able to create an After School Program Funding group which would then have all after school program Funding Categories linked to it. By creating these two groups, attendance reports can be run for a specific Funding Category Group and all corresponding Funding Categories. Steps: Admin Gear > Code Management > Funding Category Click here for Help! While each of the aforementioned setup pieces are key to your attendance setup, funding categories are the meat and bones of the ADA calculation. Funding categories are used to categorize students into a specific group for the sake of funding. For example, if a district/CMO is receiving special funding for their independent study students, the district could create a funding category entitled Independent Study, in which all independent study students could be placed in. This funding category would then show separate from the Regular Attendance category on all ADA affiliated reports. For California Districts/CMO, these categories are then reported on the state reports commonly referred to as P1, P2, and EOY. Steps: Attendance > Attendance Programs Click here for Help! While funding categories enable districts to track and report traditional and unique programs, attendance programs are needed to establish the required minimum student enrollment minutes per day for each grade level and each funding category. By default these minutes are set to match the state’s expected minimum and absolute minimum values. However, in certain circumstances and for specific programs, these minute values may need to be adjusted; these adjustments will be made by your Implementation Manager as part of your attendance setup and customization. These minutes are used to evaluate whether or not a student is attending enough minutes each day for the District/CMO to receive Funding. Steps: Admin Gear > Attendance Flags Click here for Help! Attendance flags, as in the marks teachers and front office staff will use to indicate whether a student is absent or present, also have a large impact on the attendance calculation. As mentioned before, each state, district, and site has unique attendance tracking and reporting needs; due to that, Attendance Flags are 100% customizable, meaning each district can enter their own flags! 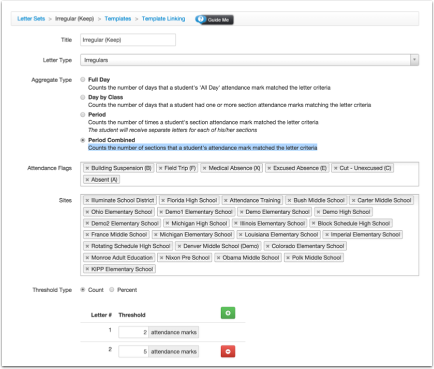 As part of the attendance setup, a district/CMO will go in and create their own attendance flags; for example, a district can create a new absent flag called Unexcused Absent and select its display code. 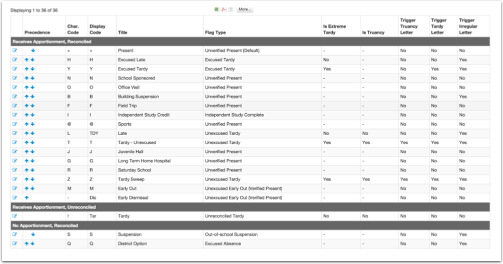 In addition to selecting how this code will display in the UI, the district will be able to select whether or not this flag is a truancy flag, which attendance letter type it should count for, and also delineate which users will be given access to this flag. Apportionment refers to whether or not the mark counts as a present and will count towards funding on ADA reports. Reconciled and Unreconciled refer to whether or not the specific flag has been confirmed or not. Steps: Attendance > Attendance Letters > Manage Configurations Click here for Help!